Alan Conway of Hauxley Dairy Farm told The Ambler he was thrilled to learn about the awards. An enterprising farmer has won an award for his dedication to animal welfare standards, and is also in the running for Dairy Farmer of the Year. Hauxley Dairy Farm has won the Responsible Farming award from First Milk, in recognition of their dedication to improving animal welfare and performance. Much of the farm’s milk is collected by First Milk, a farmer’s co-operative. It is then turned into cheese at the Lake District Dairy Company and often ends up as Pilgrims Choice or Sainsbury’s and Tesco’s own brand cheddar. Hearing he had also been nominated for Dairy Farmer of the Year in the Northern Farmer Awards was a bit of a shock. Alan said “I was balancing on top of a 16 foot bale of hay trying to tie it down, when my mobile rang with the news. I thought ‘What? Hold on, I’d better stop what I’m doing here!’ I am pleased, of course, but a little bit daunted. The dairy farm uses a robotic milking system for its 130 British Friesians, and has diversified in the last year, by launching a milk delivery service and installing a vending machine at the entrance to the farm. 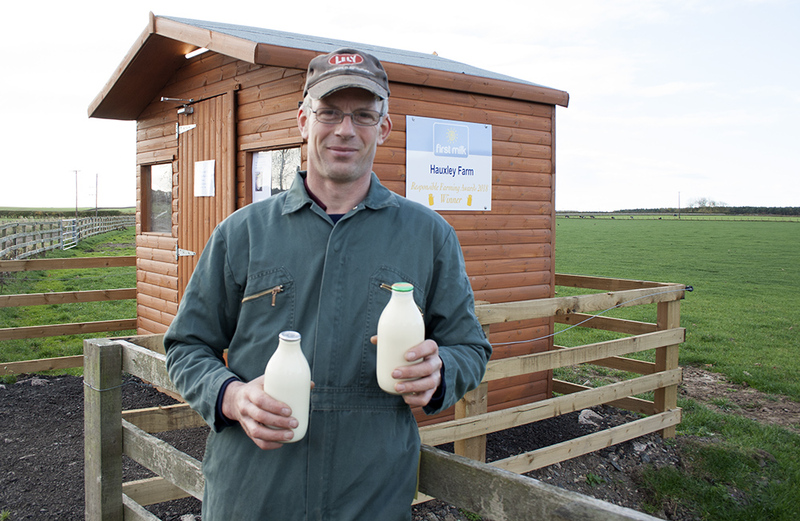 Both ventures have proved very popular, not least because they sell their milk in recyclable glass bottles. One thought on "Welfare award for enterprising farmer"